Immunologist Megan MacLeod collaborated with Eric Schockmel, leading towards the creation of the work Immunecraft. This work adopts the form of a video game trailer, presenting a fictional game which gives users agency over real life cell culture to compete against opponent players. It explores the parallels between popular gameplay mechanics and some of the most important principles of the human immune system, including cellular memory and autoimmunity. It understands itself as a piece of speculative design futures, commenting on the principles of multiplayer online gaming in the age of DNA building blocks, printable organic electronics and biohacking, thus raising questions about bioethics. Artist Charlie Tweed created the animation The Signal and the Noise in collaboration with biochemist Dr Darren Logan. This work exposes the parallels of computer coding and genetic coding in humans and animals. Its narrators, an anonymous group of hybrid machines, look at these creatures as inefficient machines and consider ways of editing and improving their code. The film draws upon the latest advances in DNA sequencing technology, as well as new ways of controlling behaviour, such as Optogenetics, to propose a future vision of hybrid computing devices that are used to monitor and repair living things, resulting in better performing humans and animals. Whilst the work appears to be a piece of science fiction, all of the technologies and ideas discussed are based on actual advances and research, and visions of how things might materialise in the future. Join some of the artists and organisers including producer Abigail Addison from Animate Projects, scientist Bentley Crudgington, and curator Sarah Cook for the preview of Silent Signal, a touring exhibition that has now come to Dundee and taken on a different form in LifeSpace. All are welcome to join the preview of this exhibition, after which the exhibition will be open to visitors on Saturdays from 11am-5pm or by appointment. Discussion about points of interest in the history of human guided evolution during the last 10,000 years, with the Center for PostNatural History director Richard Pell and University of Dundee researchers. Programmed as part of That was then. 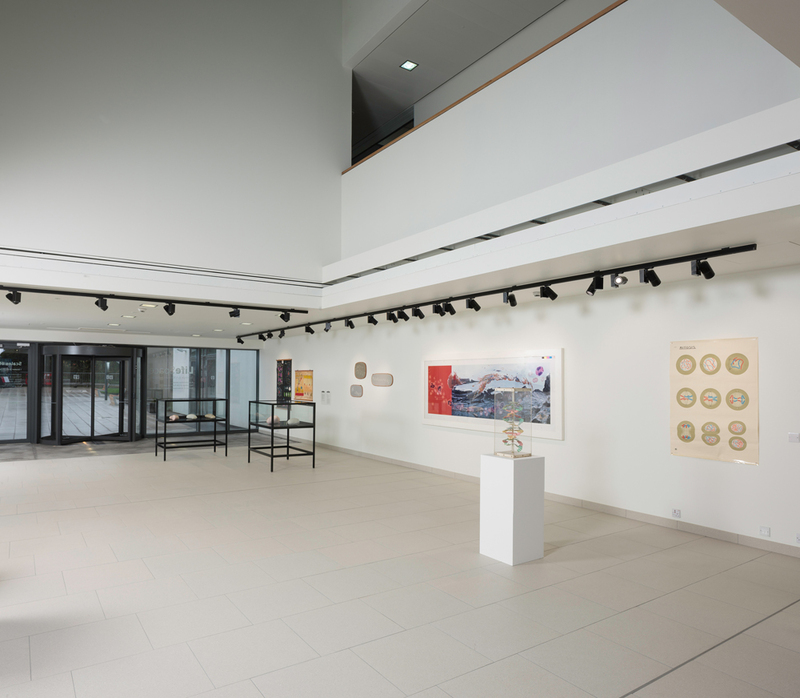 This is now - an exhibition from the Center for PostNatural History telling the stories of the origins, habitats, and evolution of organisms that have been intentionally and heritably altered by humans, featuring current research specimens, and historical artefacts from the University of Dundee. Preview of our new exhibition, Hormonal, on the 3rd March at 5pm. More information about this exhibition can be found on the exhibition's page. Everyone is welcome to visit LifeSpace during the Life Sciences Open Day, on Saturday 7th November 2015 from 11am-5pm. The exhibition on display is Mat Flemming's Seeing through the see-through. This open day is part of Imagine, Explore, Discover - Science at the University of Dundee. A preview of Mat Flemming's exhibition Seeing through the see-through takes place on Thursday 29th October 2015, 5-7pm. The preview includes an exhibition tour with the curator, artist and scientist at 5pm. Everyone is welcome for a look at the new exhibition and a drink. To coincide with the two-part exhibition Hearts & Minds, and to mark the closing day of the show at LifeSpace, Dundee Contemporary Arts presents Karen Guthrie and the multi-award winning film The Closer We Get. Join us from 11am on 19 September 2015 for Doors Open Day at the Discovery Centre and LifeSpace, as part of the National Doors Open Day event. Artist Aidan Moesby will be present with curator Sarah Cook to talk about the current exhibition Hearts & Minds. Tours will also be available throughout the rest of the afternoon as part of the main Life Sciences tour departing from the Street at 12pm, 1pm, 2pm and 3pm. Join us for the preview of our new exhibition, Hearts & Minds, on September 18 at 5pm. Exhibition tour with the curator and artists starts at 5pm.